I don't do a lot of Sunday weddings, and when I do they are usually at the Wedding Gazebo at my parents, Vernon and Francine Jackson's home in West Bay. This way I can accommodate our clients who want a Sunday afternoon wedding, and visit with my mom and dad at the same time. Sunday tea with the grandparents is something both my children and my grand-children enjoy. 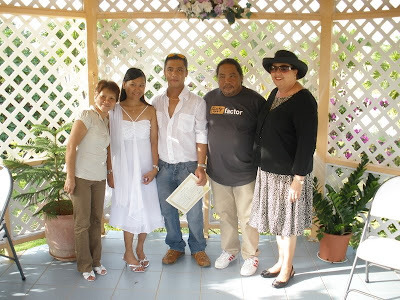 This young Filipino couple met in Grand Cayman where they are employed at the same restaurant. 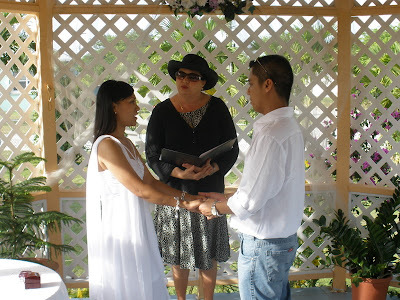 Here I am explaining to them that they must go to the General Registry, in the Citrus Grove Building on Goring Avenue, George Town to get their Registered Marriage Certificate. For my visitor clients I mail this certificate to them, for my local clients they usually go and get it themselves once I have filed their marriage. I file my marriage certificates on the first working day after the wedding, usually at noon-time, which means couples can easily collect this important document, the legal proof of their marriage. Posing here with their witnesses. Our law requires two witnesses over the age of 18. Most residents will bring their own witnesses, but for visitors we can provide the witnesses if necessary. 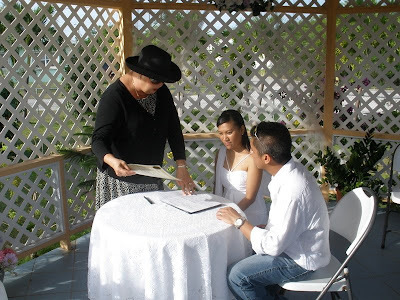 There is no charge to have your wedding at the Wedding Gazebo. Residents wishing to be married should remember that there must be 7 clear days between the day their Banns of Marriage are posted, and the day the wedding takes place. Call (345)94 9-9933 to make an appointment to come in for your interview, to give us your wedding particulars and to complete and sign the required Notice of Marriage form. Both parties must be present at the initial interview, unless you have made arrangements with Joy for one of the parties to be interviewed separately prior to the wedding.